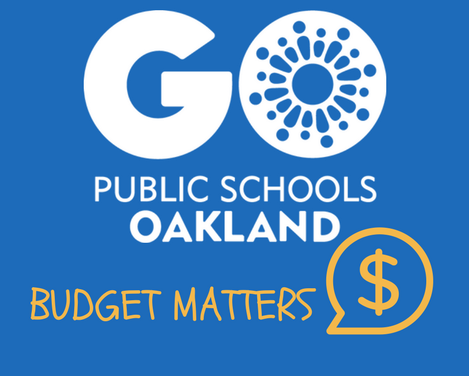 This blog post is part of our continuing efforts to keep you in the loop about OUSD’s alarming mid-year budget adjustments. As we discussed previously, the district is at great risk of state intervention unless we make serious changes both in the short and long term. So the most immediate questions for the district are: What is the final number? How disruptive will the adjustments be? And will it be enough? The fact that the County and State have been clear that OUSD risks intervention unless it makes significant adjustments to this year’s budget. This will show that they will both not run out of money this year and make progress toward general financial improvement. The scope of the proposed mid-year adjustment range from $14.2 million to $27.4 million. $14.2 million was proposed by OUSD staff and is intended to give a degree of confidence that OUSD will finish the year without a budget emergency like last year. OUSD staff presented data from previous years and saw some places where OUSD might have underbudgeted for this year (see table below). $8.0 million to restore the Self-Insurance Fund to last year’s level (i.e. fund used instead of private insurance). Where did the $14.2 million estimate come from? The $14.2 million proposal is designed to give OUSD (and the county and state) a degree of confidence that they will finish the year without a fiscal crisis. We break down the estimate below. -$1.2 million to rebuild the reserve to the state minimum (approx $10 million). -$7.9 million: When OUSD closed the books, they overspent their budget by $7.9 million. 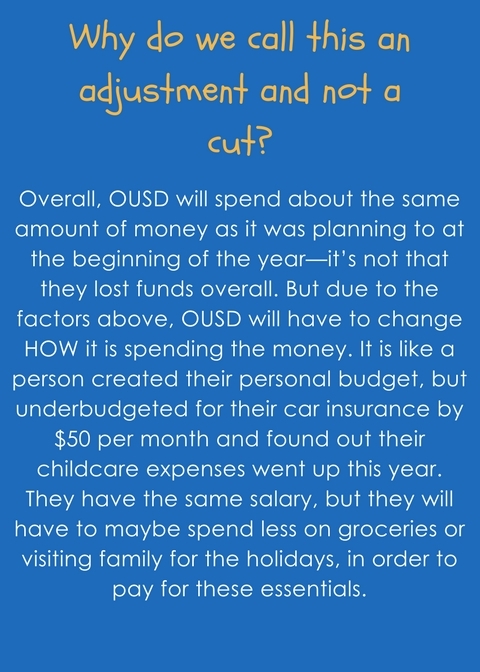 Therefore, staff is recommending that in order to be confident that OUSD will make it through the year, they should make adjustments and hold this money in reserve in case there is more overspending. Reviewing past spending patterns (they might have underbudgeted for certain categories). -$4.3 million to account for possibly underbudgeting for special education, early childhood education, and in nutritional services. In the past few years, these programs’ combined budget has increased by $5 million per year. However, last spring, OUSD only budgeted for a $0.8 million increase. OUSD would not automatically increase their budgets, but this would be in case they went over budget. -$1.0 million in possible audit findings (OUSD has had a history of audit findings with fines, so they are playing it safe putting this money aside). When will the final size of the adjustment be decided? According to the presentation, the Budget and Finance Committee with meet on Monday October 30 to set the final number. They will review the staff number and then set savings targets for the reserve and self-insurance. When will we know what will be changed as a result of the mid-year adjustments? On November 8, at a special board meeting, the Board is slated to pass a resolution directing the Superintendent to implement the adjustments. No. While the district is no doubt working through scenarios, there has been no public discussion of what will be changing as a result of the adjustments. How big is this adjustment? OUSD’s general unrestricted fund budget for the year is projected to be $410 million. So the cut would range between 3.4% to 6.7%. 11/8 Board of Education Meeting: Special Meeting, Board votes on Committee recommendation for 17-18 midyear budget revision. One of the difficulties in making a midyear adjustment like this is that that many parts of the budget are not really able to be adjusted. For example, there are contracts that cannot be broken and labor laws that restrict other actions. It is unclear how much of the budget is basically off the table in terms of changes. There are some programs that are partially or solely funded with grants or restricted funds (money with specific uses). Therefore, changing those programs would not solve the issues. However, the district can, in some cases, repurpose those funds. In our upcoming posts, we will share some perspective about the Reserve and the Self-Insurance Fund.